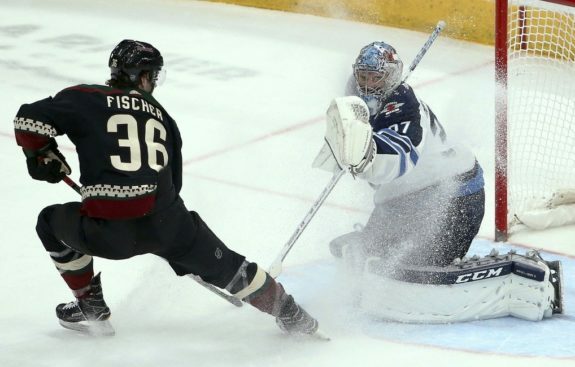 GLENDALE, Ariz. — Mark Scheifele and Kyle Connor each had a goal and an assist and the Winnipeg Jets beat the Arizona Coyotes 4-2 Saturday night to earn home-ice advantage in the first round of the playoffs. Jacob Trouba and Nikolaj Ehlers also scored, and Blake Wheeler had his 71st assist for Winnipeg, which won just two of its last seven games (2-4-1) to give up a four-point lead in the Central Division. Nashville won earlier Saturday night to take its second straight division title, edging the Jets by one point. Connor Hellebuyck stopped 19 shots as the Jets finished tied with St. Louis, but will have home-ice in the opening-round series due to a tiebreaker with more regulation/overtime wins. Alex Galchenyuk and Brad Richardson scored for Arizona, and Calvin Pickard finished with 28 saves. Scheifele scored his 38th goal to tie the score late in the first period, after Galchenyuk’s 10tj had given the Coyotes a 1-0 lead 2:21 in. Winnipeg then scored three times in the second to take control. Trouba put the Jets ahead for good with his eighth at 2:35, and Connor scored his 34th to make it 3-1 with 9:55 left in the period — just 2 seconds after a power play ended but before the Coyotes’ fifth skater could get in the play. Ehlers gave Winnipeg a three-goal lead with 21st with 4:39 left. Richardson capped the scoring with his 19th about 3 1/2 minutes into the third.